Internode (Australia) Archives · Stop the Cap! Ongoing connectivity issues and lack of competition continue to leave Australians with expensive, slow, and usage-limited broadband service. This week, Pipe Networks will make a small dent in improving international connectivity when it activates its new PPC-1 fiber link between Sydney and the U.S. territory of Guam in the Pacific. The project, first envisioned in December 2006, took nearly three years to complete at a cost of more than $175 million U.S. dollars, and has a design capacity of 1.92Tb/s run over two fiber pairs. Telecommunications analyst Paul Budde said Pipe Networks, along with others “would help to reduce this problem and will therefore provide ISPs with better prices,” which was supposed to result in a lifting of Internet Overcharging schemes like usage caps. Broadband providers in Australia have taken notice of Pipe Networks’ new pipeline, but many have not lowered prices or removed usage caps. The lack of competition has kept a price war from taking place. Ovum senior telecommunications analyst David Kennedy told Australian IT that without a price incentive, a lot of customers, particularly those served by Optus and Telstra, are unlikely to switch providers. 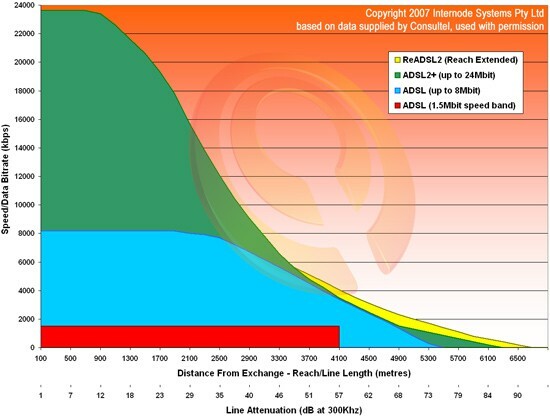 One DSL provider in Australia, Internode, has made some changes to its service offerings in response to the new fiber link. The Adelaide-based company has simplified some of its service plans, cut the price of small office/home office pricing by about $9 per month, and increased the paltry usage cap on its Easy Broadband plan from 30GB per month to 50GB per month. Internode’s Easy Broadband charges $44 a month for DSL service at 1.5Mbps/256kbps, or in areas upgraded to ADSL2+ service, up to 24Mbps/1Mbps. Actual speed on the latter service is highly dependent on how far away you live from the telephone company local switching office. Internode chief executive Pat Tapper doesn’t think PPC-1 will make a huge difference for his company. 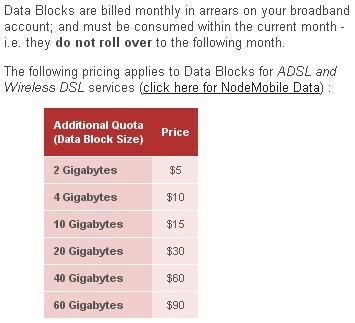 Internode sells "data blocks" for consumers intending to exceed their allowance. “In the whole scheme of things the PPC-1 circuit doesn’t represent a huge spend in terms of what it costs to run the network. It will change a little bit in terms of our overall cost but only a very small amount,” he said. That means a larger usage cap, but not cheaper pricing. Internode customers that exceed the cap can purchase additional usage blocks, at pricing starting at $2.20 per gigabyte.